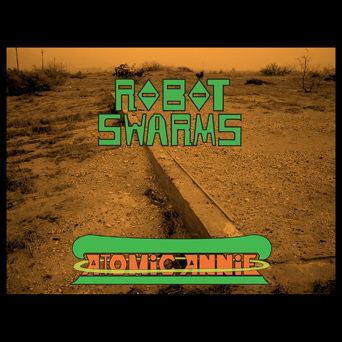 Link to Preview of new song "BIOS"
Just click BUY and put Zero $ and download should start. Been like 3 years from last post. Been busy bringing up a little Joey. Enjoy and May the Shorts be with You. MP3.COM has a new feature that lets independent artist's upload music. I uploaded some tracks and pictures and it worked very well. similar features, but I think MP3.COM will take over. Atomic Annie was featured Last week as a "Featured Artist of the Day"
on the front page of MP3.COM. 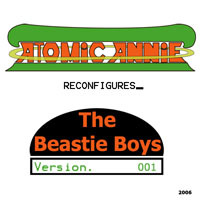 I finished the first Beastie Boy RECONFIGURES "remixes" song called Crawlspace. is the first track I have made. New Remix Track "PUBLIC EMEMY: By The Time I Get To Arizona"
I finally finished a remix single of Public Enemy's song "By The Time I Get To Arizona". All the music was re-done, only Chuck D's vocal tracks are original. 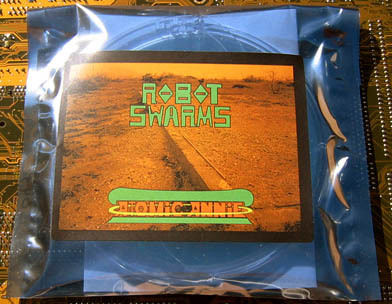 Right Click Link and Choose "SAVE AS"
I finally got around posting some pictures of the new Robot Swarms CD artwork. along with a sticker, here are some pictures.